Panama City in 2015 - Economy or Business? Last week I posted about our travel plans for next year. We are strongly considering heading to Panama City for my birthday in March. We've always wanted to go and the fact that United flies direct from Denver maximizes our time on the ground. Award availability on the route is scarce so our plan is to pay cash for the tickets. Looking at flights for the weekend we want to go, they're actually pretty pricey. Economy tickets (roundtrip) are going for $951. But business class tickets (United domestic first) are only $200 more. The business class tickets book into United "P" class which earns a 50% bonus over economy on both award miles and PQMs. So while I certainly don't "need" the meals, drinks, and bigger seat that come with United business...$200 is a pretty small premium to pay to be a bit more comfortable during 12 total hours of flying. The flight is 2,630 miles each way. So as a United Gold, I'd earn 7,890 award miles. The "P" class fare would give me an incremental 3,945 United miles which I value at about $80. Even discounting the extra PQMs, is flying upfront worth $120 each? The flight is expensive so I don't think it's that good of a deal but certainly interesting that the flight is only pricing $100 more upfront each way. Last week, I posted about how to maximize your stays by reaching out to the hotel prior to arrival. Today's post will cover the same concept but for flights. When booking an award with multiple alliance partners, you'll typically receive a confirmation number for the airline with whom you booked the ticket. So for our upcoming flight to Bali, we booked through United yet out flying on United, Asiana, and Thai. The United confirmation number is key to selecting seats/meals/making adjustments to the United portion but I don't really care about that since it's a simple three hour flight to NYC. 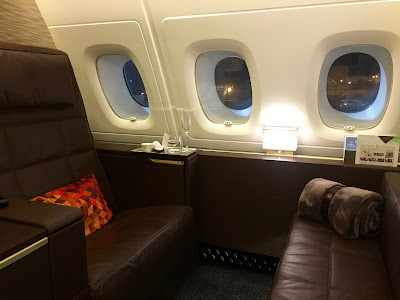 What I do care about (at least for purposes of this post) is the next 23 hours of flying in Asiana and Thai premium cabins. To get the confirmation numbers, simply call up United and ask for them. Write them down as you will need them later! You can also email customer service of the airline you are flying on (i.e. Asiana, Thai) and provide your name, flight number, and date and they should be able to respond back with their confirmation number. I have done this successfully with Thai many times. They have a reservations office in LA and usually respond back within 12 hours. Once our hotels are locked in, I search online for an email address for reservations, the concierge, front office manager, etc...These are usually pretty easy to find and with luxury hotels are typically located on the website. I heard back from each property within 12 hours. We've gone back and forth a few times (there is a 14 hour time difference) to work out the details. I now have confirmations for transportation, VOA (Visa on Arrival) service, and our arrival times. I will print out the emails prior to our trip and put them in my "trip folder" in my carry-on. Again, this is all common sense but can be really helpful to get everything squared away prior to departure. It makes things go a lot smoother and helps to manage expectations.